ALL ONE THOUSAND NAMETAGS ARE FINISHED!!!! (Sorry, for screaming, but I am so excited and relieved.) Here is a picture of the last 70 tags, I just finished. Thank you Kristin at BBD Supplies for the felt flowers and circles. Couldn't have done it without you and all of YOU my friends who have cheered me on. Thank you! So, let's celebrate by having a little GIVE AWAY!. Yeah! Remember, the little sneak peak I gave you in my last post?! I think, this little pocket belongs to one of the cutest things I have made so far. I know, I say that quite often, but I really like it and I have received more inquiries on it and the girls have received more compliments on this design, than on any others before. It's my new "Anika Twirl Skirt with attached zippered Purse". You like??? If you do, you can win a copy of the pattern before it goes on sale in my Etsy store. 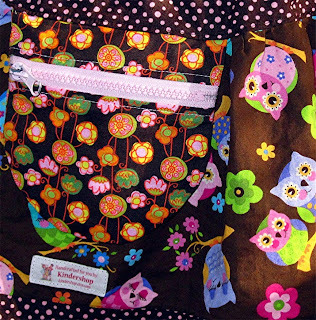 The pattern is for sizes 2T - 5T and includes a very detailled pictured tutorial and pattern pieces for the purse. The Purse is the highlight of the pattern. My girls LOVE it! It holds their Chap sticks, sun glasses, hair clips and typically numeruous trinkets. It's even big enough to carry a Beanie-Baby-size stuffed animal. 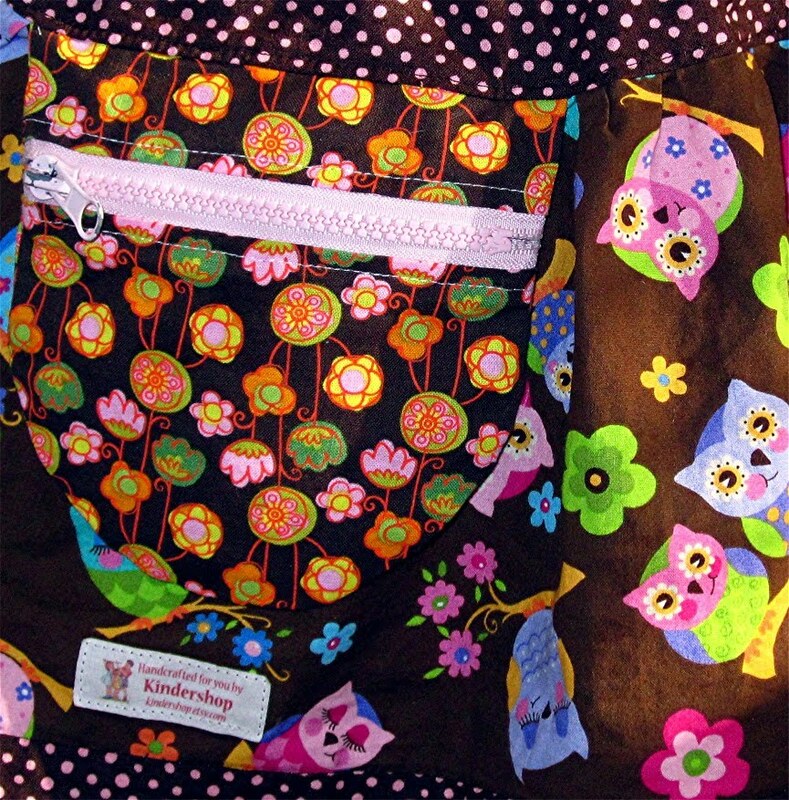 The pattern is a real playground for mixing and matching different fabric prints. Everything goes. The only limit is your imagination. So, if you like to win a copy of the pattern, simply leave a comment on this post and tell me how much you love the skirt ;-) Just kidding, just tell me what you are working on right now, or what your next project will be, or maybe you have a link to a new tutorial that you really like. Or, just tell me where you will go on vacation this year! Good luck. I will be picking a winner sometime at the end of the week. BTW, the pink skirt in above picture is for sale right here. I do love the skirt and wish my 11-yr-old daughter could wear it!! I'm working on beach totes right now, haven't done a lot of apparel lately for some reason. Enjoying your blog! I always say that the next project will be something for me... 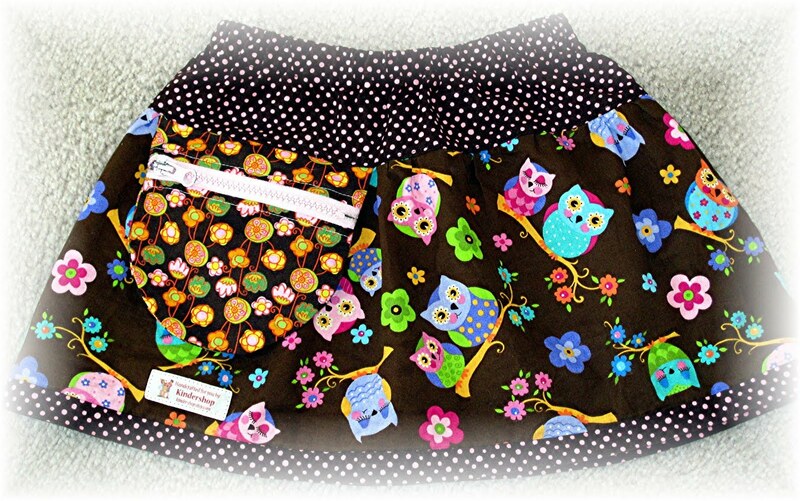 But I will most certainly make something for my girls (maybe a skirt for my 4 year old... if I'm lucky ;) ). I am also helping my oldest (9 y.o.) get her sewing project for 4H started. I switched her to a new group so she would be with someone known for teaching sewing. I can sew, but I sometimes lack patience when teaching my girls something like that (I inherited my dad's perfectionist tendencies). Congrats on finishing your HUGE order! The new skirt is darling and that little purse is genious :) My girls like to stash things, too! I'd like to sew the Domesticated Skirt for me soon. Really cute skirt! I am refashioning an old grad dress into a princess dressup dress. So far, so good. That is adorable Beatrix! And I'm so happy for you that you're finished the tags...(I know how much work that must have been!) Right now I'm working on repurposing lots and lots of items into Rags for Craft Hope! right now working on...nothing! Ha! taking a short sewing hiatus. Congrats on finishing - that must feel terrific! And I LOVE that skirt. My daughter would go crazy for it - what a great idea for adding a little zippered purse!!! My latest project is a table quilt. I'm doing straight-line quilting and it is taking me FOREVER. My next project will be more quilting - I have two more basted and I told myself I need to finish them before I start anything else! YAY!!! Now you can spend more time blowing us away with all that ADORABLE sewing you have STILL been managing to get done ON TOP of 1000 nametags!!! UGH!! I give up, you win...you are the QUEEN of multi-tasking!! :D Really..soooo happy you finished! What a fantastic idea for a skirt pattern...genious!! I have been busy doing NOTHING! But I did just buy some really soft cotton/poly blend that I am going to attempt to make swimsuits with...wish me luck!! Such a cute skirt. Right now I was working on make my tween daughter some coke tab bracelets. Wow! Congrats. I know the feeling of relief after finishing a big order... just finished one myself! That skirt is SO darling! Now I'm working on a laptop bag for a friend. Love the skirt =) It is super cute. See anything you like on my blog? Send me an email I would like to work with you.